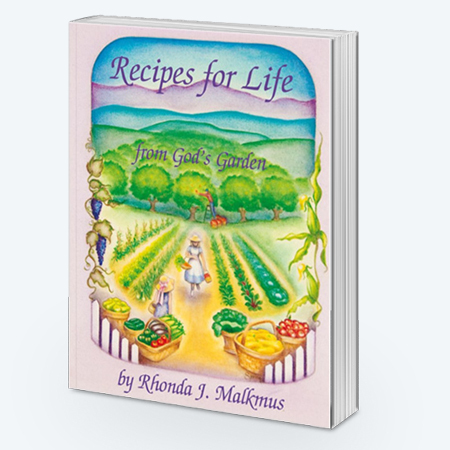 Recipes for Life…From God’s Garden by Rhonda Malkmus, helps you put into practice what you learn from God’s Way to Ultimate Health. With more than 400 nutritious and delicious recipes, you will see that healthy food really does taste wonderful! It also has important chapters on how to feed children, young adults, and even babies. Includes daily menu suggestions, index lists, and a glossary of ingredients.All recipes are vegan and most are raw, in keeping with the 80% raw, 20% cooked ratio of the Hallelujah Diet. Chapter 25 of Recipes for Life…From God’s Garden is titled “Delightful Dehydrates” and includes 9 pages of recipes for making dehydrated vegetable chips, crisps, fruit roll-ups, fruit leather, granola, and herb seasonings, a way to provide tasty treats that are still raw! We recommend and use the Excalibur Dehydrator because of its thermostat which allows you to keep the temperature below 105 degrees Fahrenheit, thus retaining vital enzymes and other nutrients.